Throughout the midwestern states of these here United States, passersby and pizza parlor enthusiasts might notice an extra treat waiting for them. For Atlas Obscura, Anne Ewbank writes of a recent proliferation of combination Pizza Hut and Little Free Library in Wyoming, Montana, Kansas, and even Texas. Ewbank spoke to local businesswoman from Kansas, Lynda Carrier-Metz, who spearheaded the project. 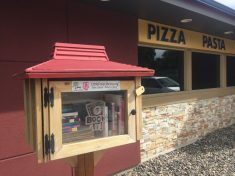 So, if you ever find yourself trying to hook up with some friends out in the Midwest, just be sure to let them know which combination Pizza Hut and Little Free Library you’re actually at.